Ultra-Compact (UC) form factor design for 4K Resolution (≤2.2μm pixels) optimized for 1/2.5” sensors, supporting up to 1/1.8” sensors. Compact (C) form factor lens designed for true factory automation, supporting up to 2/3” sensors. Compact Instrumentation (Ci) versions of our C Series fixed focal length lenses designed for instrumentation integration. Compact Flexible (Cx) modular versions of our C Series fixed focal length lenses designed to accommodate interchangeable accessories. 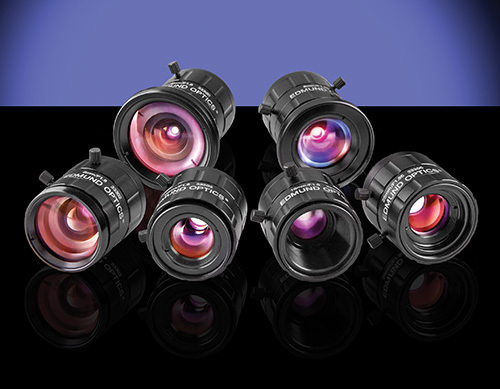 High Performance (HP) lenses optimized for 2/3” and 1” sensors, supporting up to 4/3” sensors. Covers Larger Format (LF) sensors up to 43.3mm diagonal and are F-mount compatible. Double Gauss (DG) design for low distortion and supports up to 4/3” sensors. Designed, coated, and tested for SWIR wavelengths and feature low f/# for high throughput.